The political trinity of Jignesh Mevani, Hardik Patel and Alpesh Thakor on Saturday upped the ante against Gujarat government following the death of Dalit activist Bhanubhai Vankar on Friday. Angry crowds shooed away BJP MLAs from visiting the deceased’s family, while demonstrations were held in various parts of the state. “The Chief Minister (Vijay Rupani) should drown himself in the Narmada river. Gujarat does not belong to Rupani’s father,” said a furious newly-elected Dalit Independent MLA from Vadgam Jignesh Mevani while leading protests on the Ahmedabad-Gandhingar highway. 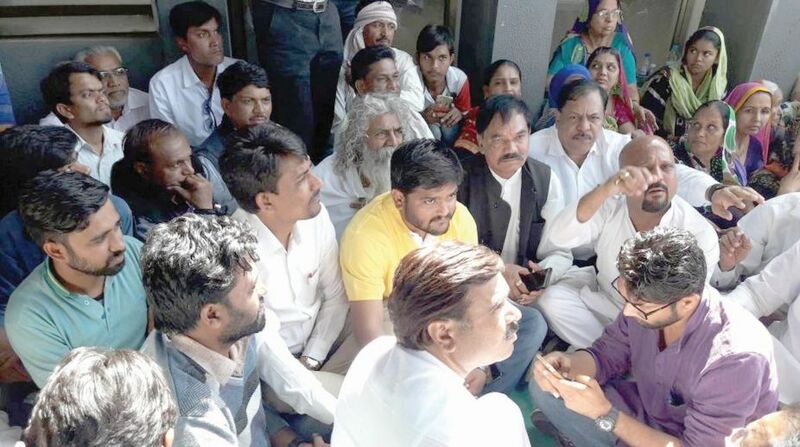 Patidar leader Hardik Patel and OBC leader and Congress MLA Alpesh Thakor visited the family of the deceased and demanded firm action and justice to the community. Leader of Opposition in Gujarat Assembly Paresh Dhanani also called on the family. Vankar, who set himself on fire at the Patan district collectorate demanding physical possession of land allotted to a Dalit family on Thursday, succumbed to his burn injuries on Friday night at a private hospital in Ahmedabad. What led to widespread anger was that Vankar had resorted to self-immolation on the premises of Patan collectorate in the presence of police, ambulance and fire-fighters after a week-long notice to the authorities. He had been seeking physical and legal possession of the land allotted to the Dalit families by the state government for some time. Vankar, 60, had arrived at the Collector’s office along with the Dalit family of Hemaben and Ramabhai on Thursday, drenched himself in kerosene and set himself on fire. He sustained 96 per cent burns and was critical ever since he was hospitalised. This led to a series of protests by Dalit activists across the state on Friday night and Saturday, including in Gandhinagar, Unjha, Chanasma and Patan in north Gujarat and Morbi in Saurashtra, with many resorting to blocking traffic and burning tyres. The family of the deceased refused to accept the dead body and put forth a charter of seven demands before the state government. The crowd at Gandhinagar hospital, where the dead body of Vankar had been kept, drove away BJP legislator from Kadi Karsan Solanki and Hitu Kanodiya from Idar, both Dalits, who had come to see his family, while they allowed Hardik Patel and Alpesh Thakor. 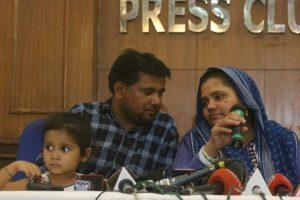 The state government swung into action and sent a delegation of Gandhinagar Collector, Inspector General of Police and Social Empowerment Secretary to talk to the Dalit activists and family of Vankar. But the meeting failed to break the deadlock. Although the government claimed to have accepted the key demands of the family, the Dalits wanted a categorical assurance in writing. Deputy Chief Minister Nitin Patel told reporters: “We have agreed to all their major demands. We would legally transfer the land in name of the family Bhanubhai Vankar was fighting for, pay a compensation of Rs 8 lakh to the family of Vankar and transfer his family members, who are government employees, closer home. This, however, did not stop Jignesh Mevani from leading a group of his supporters on the road connecting Gandhinagar and Ahmedabad — SG Highway — causing blockades and stopping traffic. “The Chief Minister has become shameless. Vijay Rupani, drown yourself in Narmada. Why don’t you die of shame. This is not your father’s Gujarat,” he said and appealed to Hardik Patel and Alpesh Thakor to join him in intensifying the stir in the state from Sunday. “The Chief Secretary must bring out a notification to initiate similar process for landless Dalits across 33 districts of the state. Till then we would continue our fight,” Mevani declared.